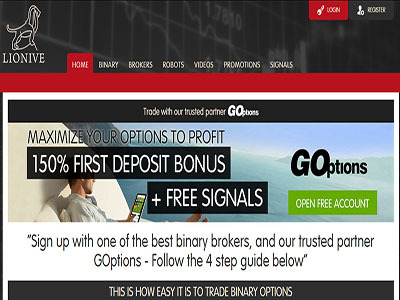 Is Lionive.com A Good Or Bad Binary Options Broker? Lionive are no longer trading. For a list of alternative brokers, and full comparison reviews, visit our brokers page. Established with the purpose of providing binary traders with a reliable and safe environment for trading binaries, Lionive is based in Mahe, in the Republic of Seychelles. The broker is recognized as a beginner-friendly binary broker. This is due to its extensive educational center and dedicated customer support. In addition, many traders love trading with Lionive because of all the advanced tools at their disposal as well as attractive bonuses offered by this broker. Lionive’s target market is the global binary trading market, as the firm aims to cater to as diverse trading groups as possible. This can be demonstrated through the many, numerous channels of depositing funds at the disposal of their traders. Altogether, there are more than 40 different ways with which traders can deposit their funds at Lionive. Customer support at Lionive is a real strength here too. Traders have the option to talk to the support team by live chat or over the telephone. Alternatively, they can also choose to email their queries to Lionive’s customer support by email at support@lionive.com. With their support agents based in Australia and Europe, traders can expect a prompt reply from the support team 24 hours a day. Even if live support is offline, a reply can be expected within 24 hours. To bolster the quality of their services even further, Lionive have also provided prospective clients the benefit of a free 7 day demo trading account. With the demo account, traders get $10,000 worth of virtual money to trade with. This allows traders to test out the intuitive trading platform and the forex market in general. Supplied by the leading binary platform provider TechFinancials, Lionive’s platform is not only pleasing to work with for beginner traders but also for more experienced traders. The large graphical interface makes it easy for a trader to monitor the progress of his trades. Towards the bottom of the trading interface, traders can also see the list of trades that they have opened as well as those which have been closed. Regular news items fed through the news section of the trading interface also help traders to keep in touch with what is going on in the market. The trading platform also allow traders to filter out the assets to be displayed so they can focus their energy on making money and not get distracted by “noise” coming from too much market movement. Lastly, Lionive’s trading platform also allows traders to have the option of closing their trades early up to 5 minutes before the expiry of a trade. This is an extremely useful feature since it permits traders to cut their losses or lock in their profits before any adverse market movements wipe them out. Currently, the number of underlying assets available at Lionive seems limited. This is perhaps due to the fact that the broker is still new in the industry. Nevertheless even with the limited number of assets available, traders will have a hard time trading every single one of them as there are four major types of trading contracts which can be further subdivided into at least two different subcategories. Trading accounts at Lionive comes in three different flavours in the form of “Bronze”, “Gold” and “Platinum” accounts. Looking at the benefits offered by Lionive, it is easy to understand why many traders, both beginners and experienced traders, are flocking to Lionive. These include platform intuivity, account types, free 7-day demo account and localization of site, platform and customer support.